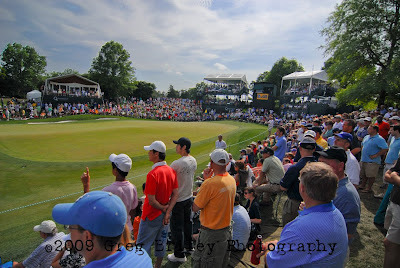 It was a great week covering the 2009 Quail Hollow Championship. 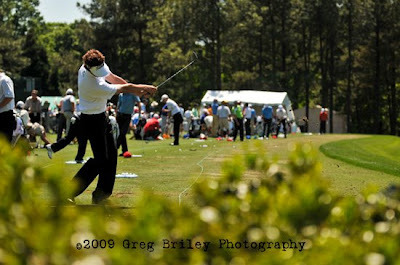 The tournament was graced with one of the best fields of professional golfers in world and great weather. 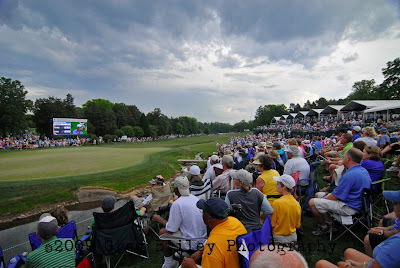 I enjoyed photographing the tournament for the 3rd year -- this year spending Tuesday, Thursday (starting at 6 a.m.), Saturday and the final round on Sunday. I am not sure how many miles I walked each day or how much my equipment weighed, but my take on these events is that it can be just as physically demanding as any sports I have played. I love every minute of it, however, and would not have it any other way. 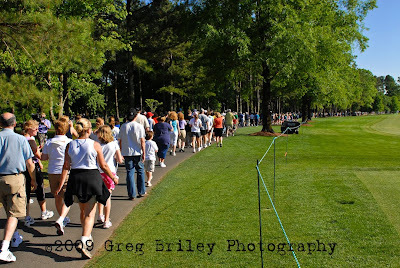 Tiger was a constant contender drawing massive crowds at every hole. This made it difficult to find good spots to capture him in action, but also provided some good vantage points to capture the fans enjoying themselves. 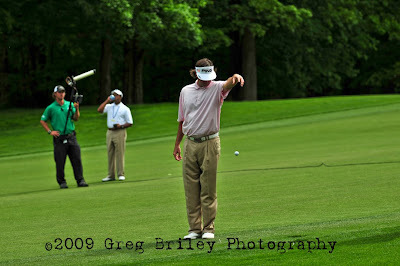 On the final round Sunday, it appeared that Bubba Watson was going to take the event, so I spent a lot of time following him. 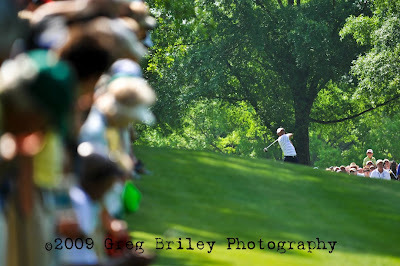 Near the final holes, however, I broke from his group to get a good spot to capture the leaders at #18. Sean O'Hair prevailed as the winner getting over his loss to Tiger Woods just five weeks ago when he dropped a five-shot lead to the champion. An interesting tidbit about O'Hair -- and plenty good reason to keep him on your radar screen -- he is the first player under the age of the 30 to chalk-up three career wins. He turned pro at 17 years of age! 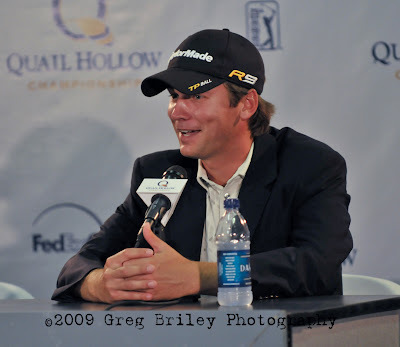 In the media room following his win, he reminisced about his play on the field, he and his wife's struggles to this point and shared some ribbing he and Tiger traded over the past few weeks. 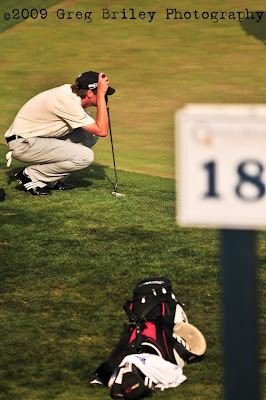 Over all, it was a great week shooting the tournament. 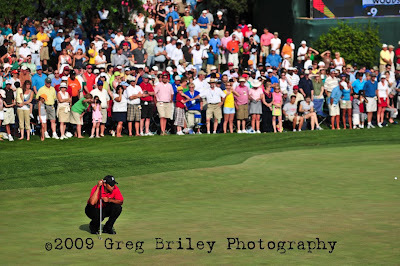 I would love to hear from you golf fans and/or if you were at the tournament. Also, feel free to let me know if you have any questions about photography in general. The following images are a mixture of event assignments and tournament photos used to promote the event each year. I hope you enjoy viewing them as much as I enjoyed capturing them. Click on any photo for a larger view. In this composite image, Tiger Woods chips out of the #8 bunker (while Jim Furyk looks on), follows his shot and then studies his next play. Golfers warm up on the practice tees. 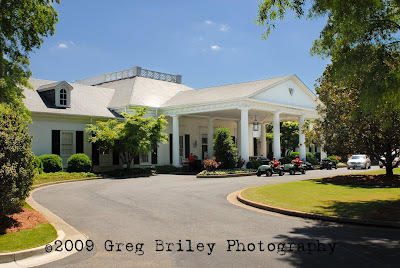 The Clubhouse at Quail stands ready and poised for the tournament. 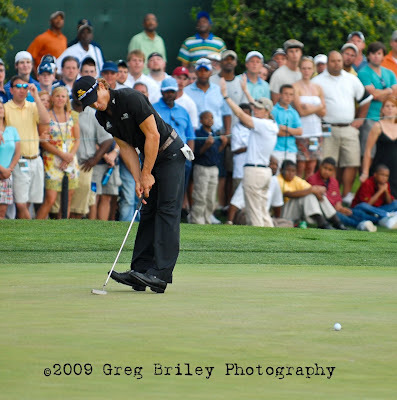 Anthony Kim is a crowd favorite since he won the tournament last year in 2008. 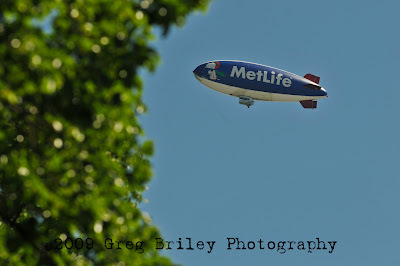 The MetLife blimp soars high above the action and is seen for miles around Charlotte during the tournament. 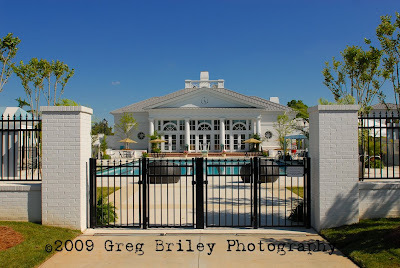 The beautiful pool area of the club at Quail Hollow. 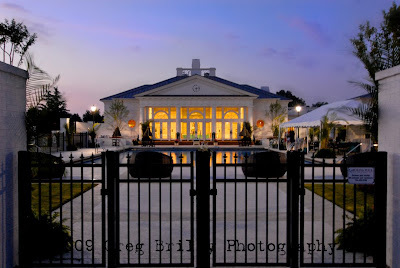 Early morning view of the pool at the Quail Hollow Golf Club. 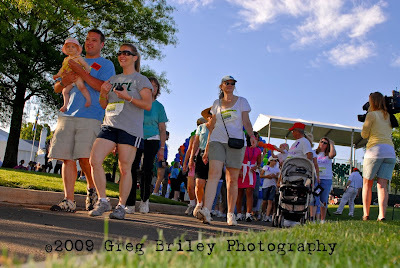 The beginning of the first ever Avon Foundation Walk the Course Against Domestic Violence. 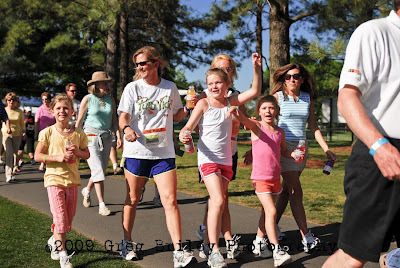 This event was held to raise funds and awareness to end the cycle of domestic violence in North Carolina. 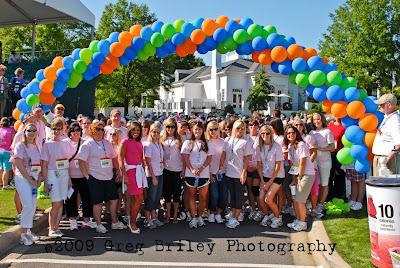 The PGA Tour Wives Association and Channel 9 News Anchor, Natalie Pasquarella, joined the walk. 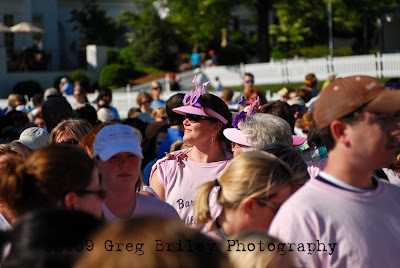 Those joining the walk to against domestic violence dressed for the occasion. Young and all joined the walk against domestic violence in North Carolina. The line of participants walking extended further than you could see. 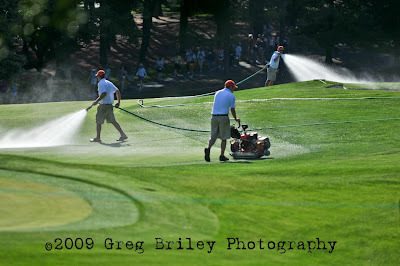 The walkers meander passed workers getting the golf course ready for the next round of play. Victims of domestic violence share their stories in an effort to raise awareness. Here, a grandmother offers her granddaughter the mic during an emotional moment in her story. What a beautiful day for a walk! 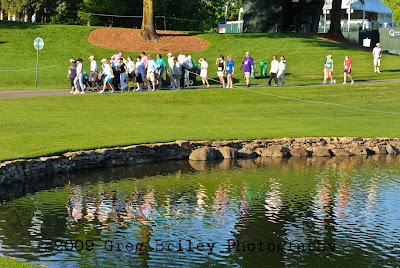 The water in this image provides a nice artistic feel and accents the beauty the walkers enjoyed as they made their way around the course. 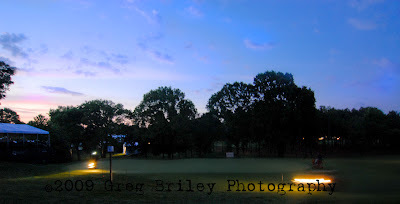 A very early morning start for the grounds crew preparing the way for the golfers on Thursday morning. The beauty of early morning light can be counted on for breathtaking photos. 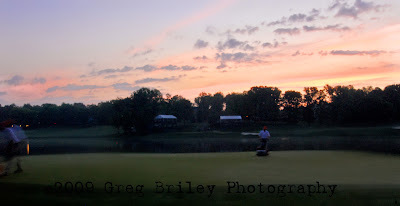 Groundskeepers work hard in the early morning light to prepare the green on #17. 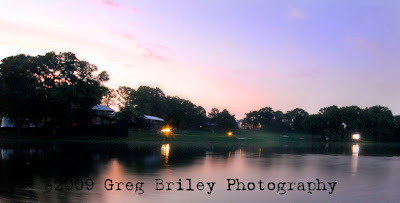 Looking across the pond at #14 in the early morning as workers race to complete their tasks before the tournament begins for the day. 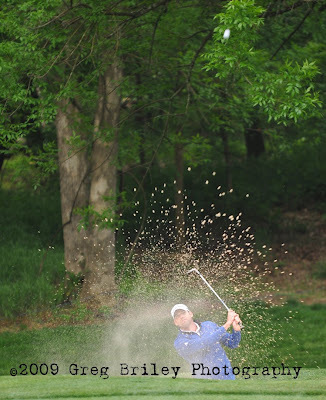 Sergio Garcia blasts out of the bunker during play on Tuesday. Capturing the ball within the photo completes this type of capture for print. Jim Furyk followed Sergio's path to the green. 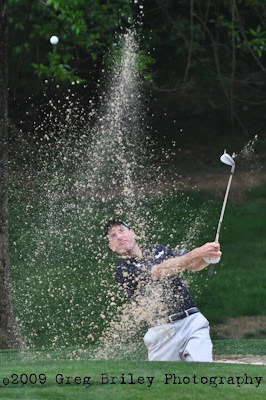 Sand-blast shots seem to always make the cut into the media's list of shots to use. To get them, you need a very fast shutter speed and rapid fire. Using natural elements can be a great way to make your image pleasing to the eye. Here, Tiger Woods lines up his shot in the distance. 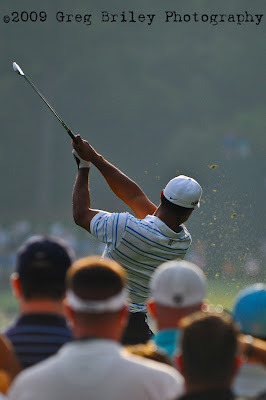 Tiger Woods tees off at hole #13. To achieve this photo effect, use a low aperture setting on your camera. 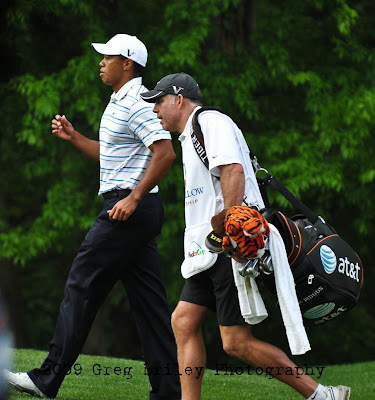 After teeing off at #13, Tiger and his caddie, Steve Williams, make their way down to the green. Cumulus cloudy days are my favorite for shooting in the daytime. However, exposure is critical not to under-expose the subject or over-expose the sky. With the right settings, as you can see here at hole #18, it can make your photos very dramatic and beautiful. 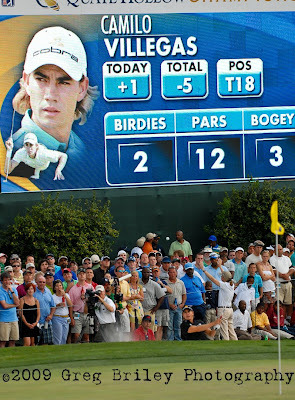 Tiger tees off at #4 as the massive crowds look on in anticipation. 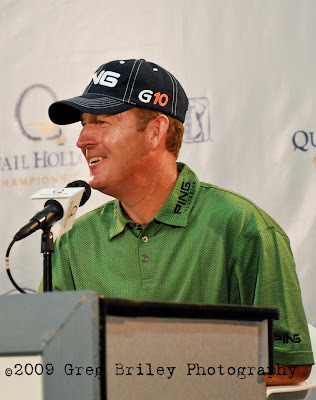 Jeff Maggert was an early leader and spoke to the media about his day on the course. Tiger discusses his early successes with the media. Achieving a low aperture number is important for shooting indoors without a flash. 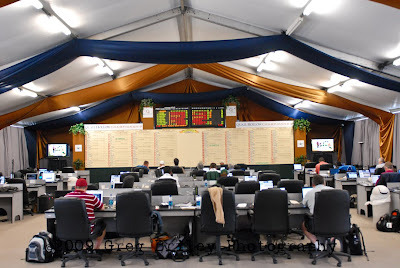 The media center is where the media outlets covering the tournament gather to create their stories of the event. 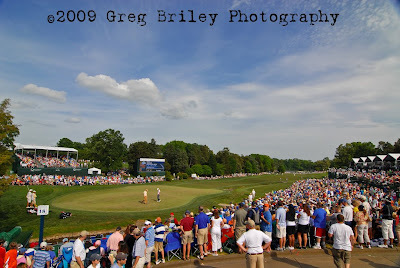 As a photographer, I report back to this location frequently during the tournament to offer up my captures for use in various media. This view captures the beauty of the course from hole #14 looking over the pond at #17. Lots of fans park here for the view. 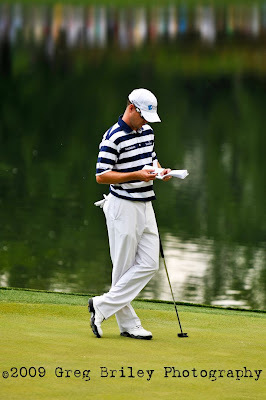 Zach Johnson studies his play book while awaiting his turn. 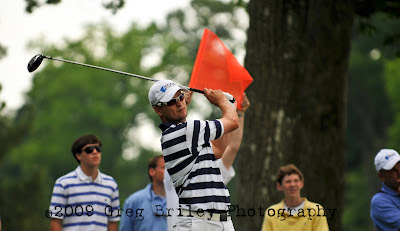 Zach Johnson tees off at #15. Zach played a great round taking the lead during one portion of the tournament. Bill Lunde makes his fairway shot on #8. Here I looked to capture players with a scenic backdrop. 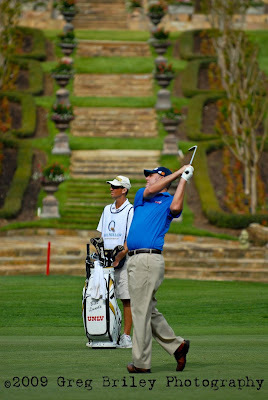 Steps leading to one of the homes lining the 8th fairway provided some nice symmetry for the image. Using a low aperture number, the player stays in focus, while the background blurs. Still on #8, a nice waterfall joined the shot for a nice play on the rule of 3rds. Notice that the player and the waterfall both fall into a third of the shot respectively. The curves of the wall provide a nice addition to the shot. 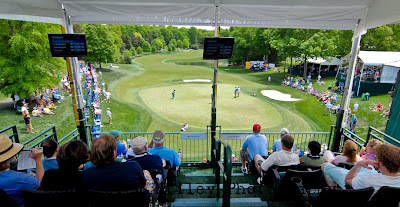 A Chalet provides a relaxing environment to view the players on the 3rd hole green. Using a combination of flash for the inside and exposing the image for the outside will bring this type of shot together. Using the same method described above, it is as if these onlookers are watching a very wide big screen TV in 3D. 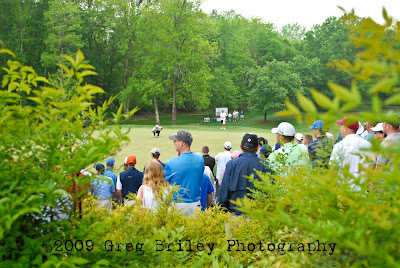 Upper level spectators on hole #15 enjoy the play of the golfers as they come by. This type of image is used in brochures and online to sell the Chalets for the event. 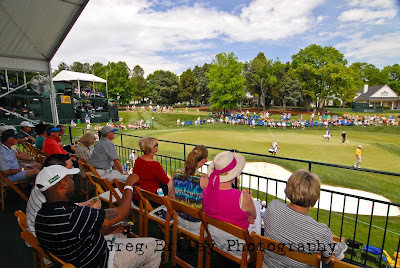 Again on the #15 green, spectators enjoy a pampered afternoon of golf on Saturday. 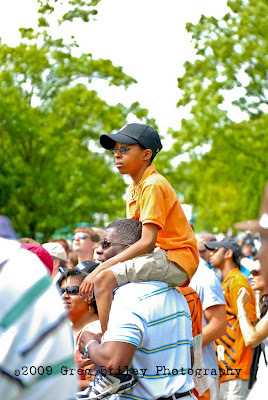 While in the lead, Tiger chips on the #5 green among thousands of spectators on Saturday. 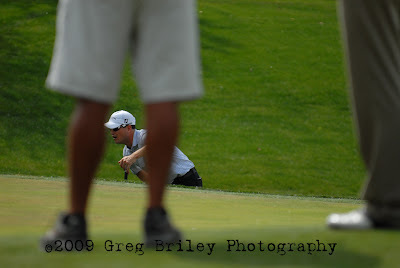 By using my selective focus, I was able to capture Zach Johnson lining up his shot through the legs of his caddie. 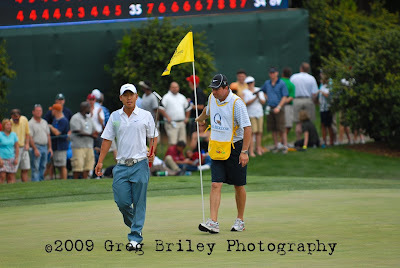 Anthony Kim finishes his round on Saturday. Including the colorful information board adds the extra element to this photo of Camilo Villegas blasting out of the bunker. Can you find the ball in this picture? Camilo uses a little body English to coax in his putt. Unique captures like this can get your shot published. A happy Phil Mickelson exits the course after his play on Saturday. Ominous clouds rolled in near the end of play, and eventually stopping activity on the course for about an hour. It made for some dramatic photography. Once again, exposure is critical on this type of image to make it work. Tiger chips onto the green on #18 with the crowds in-tow. 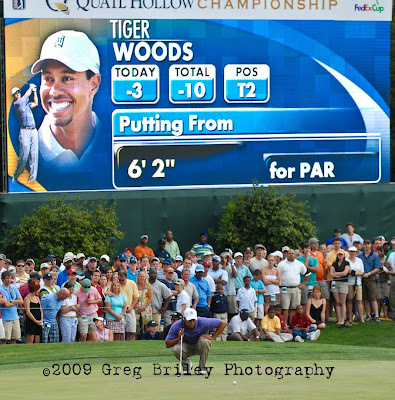 Tiger lines up his shot with his name in lights behind him. 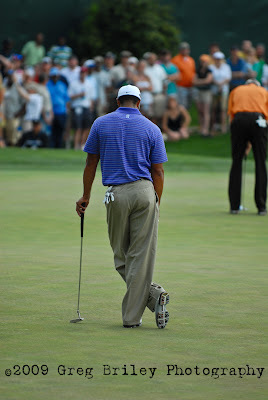 After missing his putt, Tiger contemplates his play. 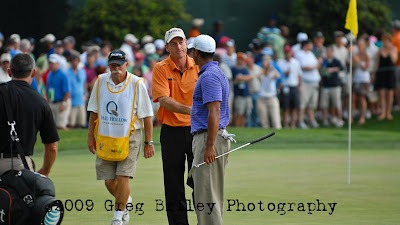 Tiger Woods and Jim Furyk shake hands after finishing their round on Saturday. 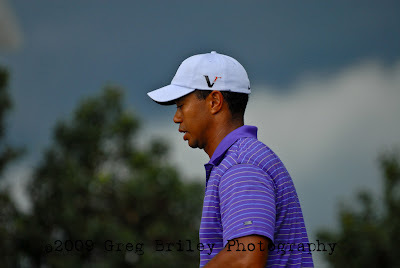 Tiger walks off the course as the storms approach to stop play. 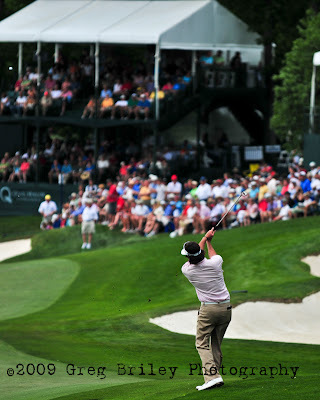 During the final round on Sunday, Bubba Watson grabbed a surprising lead. Here, he drops a ball onto the fairway to resume play. 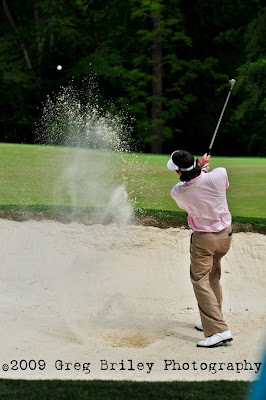 Bubba Watson blasting out of a bunker on the #13 green. 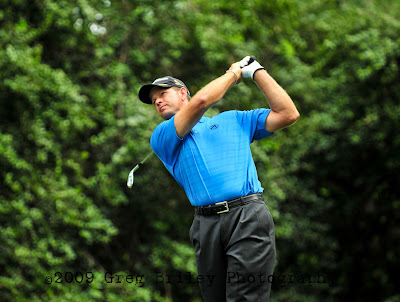 A crowd favorite, Retief Goosen from South Africa, tees off on #14. 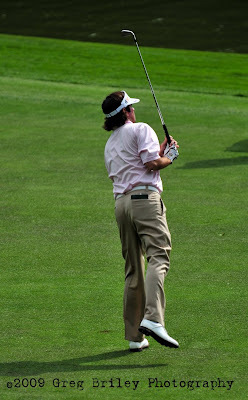 Bubba Watson using the familiar body English on his fairway drive. 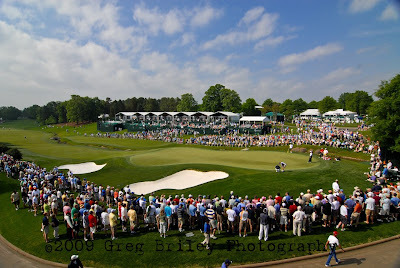 Crowds gather at the #15 green to watch the leaders of the final round. 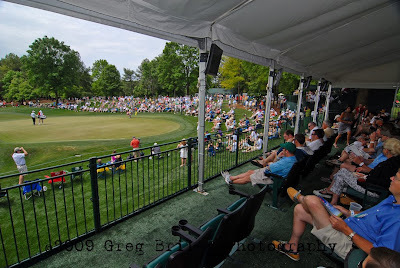 I found my spot to photograph the leaders play at #18 for the final round on Sunday. What a sight to behold -- large crowds, a sea of colors and a beautiful sky -- a great day to have a camera. Late in the day, Sean O'Hair emerged as the leader and did not look back, literally -- he shared this point with the reporters in the media center after he won. 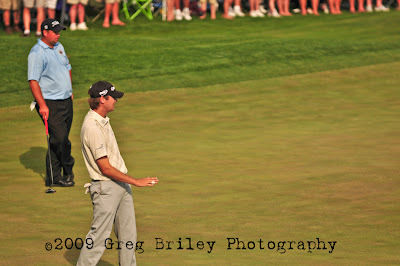 A little body English as O'Hair tries to coax his ball to stay when he missed his putt on #18 making the crowd wonder if a playoff round would be needed. Looking for a Tiger sighting. Ever looming is Tiger Woods. 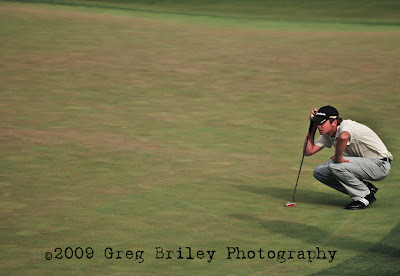 Here is lines up his putt on #18. 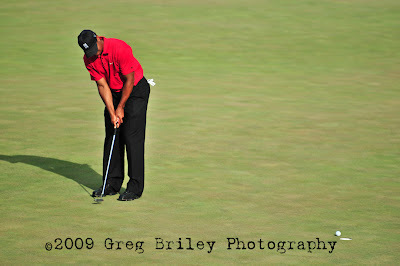 Tiger just misses his putt on #18 and taking himself out of contention for the win. O'Hair lines up his final shot for the victory. The winner, Sean O'Hair, meeting with reporters back in the media center. As a courtesy to all the TV cameras and reporters, I didn't use a flash for these images. To pull this off indoors, you need what is known as a fast lens. A lens with low aperture ability so your shutter can work "fast" to avoid any blurring. 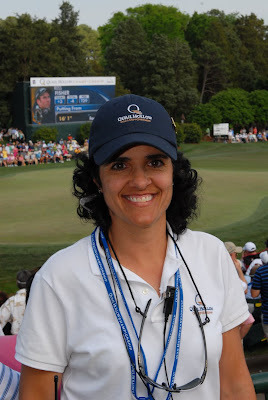 A super big thanks to Carole for driving me around the course in a cart at 6 a.m. Thursday morning to capture the beautiful early morning shots -- and to all the other ambassadors that helped us capture this amazing event they worked so hard to make such a great success. Nice job, nice photos, and great tips.